You see it’s heirloom tomato season. These are by far the best tomatoes ever. Becky, from Word of Mouth, out does herself with specials when tomato seasons comes along. It truly is the best time to visit her place. Last year she took the tomatoes, gave them a panko and 3 cheese crust and cooked them. I got a chance to try them and told her they would be good on a benedict. 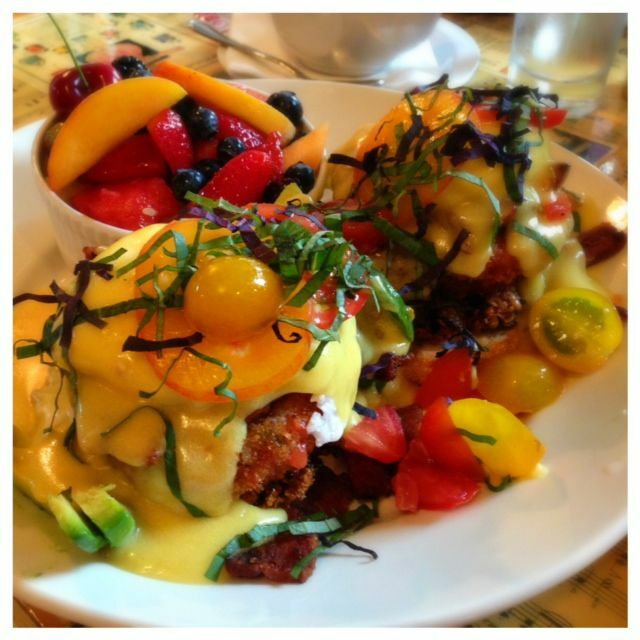 Fast forward a whole year and I find a notification on my Facebook wall that the special will be “Amy’s Parmesan Crusted Heirloom Tomato Benedict” Now you understand my need to go down and see what this was all about. The picture does not do justice as to the size of these Egg Benedicts. They were rather large with my beloved veggie patty also on them. I worked as hard as I could, but it was so large I could not finish it. First time ever I have not finished a meal at Word of Mouth. In my defense though I finished all the good stuff, I had to bail on English muffin to get the rest in. This dish was large. You might be wondering how it was? It was spectacular. There were so many layers of goodness in this dish. The crusted tomato the fresh tomatoes on top. The veggie patty (which I LOVE) and the hollandaise sauce draped over the whole entire dish and lightly topped with basil. Is it possible to smile and eat at the same time?? Stellar dish Becky. You must run this special again. Everyone needs a chance to try this. I have yet to find a place in Portland that even touches this kind of breakfast and we have searched a lot of breakfast places here. Disclosure : Yes I do get spoiled when I go down to Word of Mouth. Nonetheless the opinions are all my own and we pay for our food, so therefore I speak the truth.